Fidel Castro, who has announced he is stepping down as Cuba's president, has run the country for so long that nearly three-quarters of its people have known no other leader. Although the US has tried hard to get rid of him, President Castro outlasted no fewer than nine American presidents since he took power in 1959. In July 2006 President Castro underwent emergency intestinal surgery and has not attended any public events since. Though officials say their leader is recuperating, his prolonged absence has raised questions about his health. On 19 February 2008 he announced: "I neither will aspire to nor will I accept, the position of president of the council of state and commander in chief." He had hinted as much on 17 December, in a letter read out on Cuban television in which he said he had a duty not to cling on to power or stand in the way of a younger generation. While his (also elderly) brother Raul has been acting president since last year, the reference to younger leaders suggests Raul may not automatically succeed him. The question that remains is whether Cuba's Communist Revolution will outlast Fidel Castro. 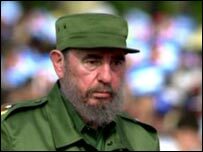 The Communist leader - known for his long-winded anti-American rhetoric - was born Fidel Alejandro Castro Ruz in 1926 to a wealthy, landowning family. 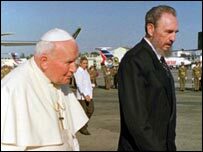 He received a Jesuit education, and graduated from Havana University as a lawyer. But, shocked by the contrast between his own comfortable lifestyle and the dire poverty of so many others, he became a Marxist-Leninist revolutionary. In 1953, he took up arms against the regime of President Fulgencio Batista. Aiming to spark a popular revolt, on 26 July Mr Castro led more than 100 followers in a failed attack on the Moncada military barracks in Santiago de Cuba. Fidel Castro and his brother Raul survived, but were imprisoned. Amnestied after two years, Mr Castro continued to campaign against the Batista regime while in exile in Mexico, and established a guerrilla force known as the 26 July Movement. 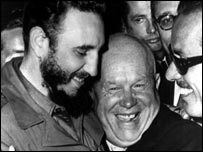 His revolutionary ideals attracted support in Cuba and in 1959 his forces overthrew Batista, whose regime had become a byword for corruption, decadence and inequality. 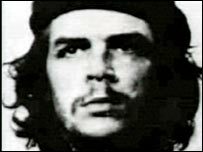 Cuba's new rulers - who included the legendary Argentine revolutionary Che Guevara - promised to give the land back to the people and to defend the rights of the poor. Fidel Castro insisted his ideology was, first and foremost, Cuban. "There is not Communism or Marxism, but representative democracy and social justice in a well-planned economy," he said at the time. He was soon snubbed by US President Dwight Eisenhower and claimed he was driven into the arms of the Soviet Union and its leader, Nikita Khrushchev. Cuba became a Cold War battleground. In April 1961, the US attempted to topple the Castro government by recruiting a private army of Cuban exiles to invade the island. At the Bay of Pigs, Cuban troops repulsed the invaders, killing many and capturing 1,000. A year later, US reconnaissance planes discovered Soviet missiles on their way to sites in Cuba. The world was suddenly confronted with the possibility of all-out nuclear war. The superpowers stood eyeball to eyeball, but it was the Soviet leader who gave way, pulling his missiles out of Cuba in return for a secret withdrawal of US weapons from Turkey. Fidel Castro, though, had become America's enemy number one. The CIA tried to assassinate him - more than 600 times, according to one Cuban minister. Getting him to smoke a cigar packed with explosives was one idea. Other anti-Castro plots were even more bizarre, including one to make his beard fall out and ridicule him. The Soviet Union poured money into Cuba. It bought the bulk of the island's sugar harvest and in return its ships crammed into Havana harbour, bringing in desperately needed goods to beat the American blockade. 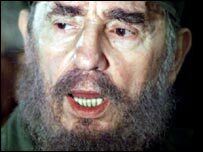 Despite his reliance on Russian help, President Castro put Cuba at the head of the newly emerging Non-Aligned Movement. Yet, in Africa especially, he took sides, sending his troops in to support Marxist guerrillas in Angola and Mozambique in the 1970s. But the 1980s era of Soviet leader Mikhail Gorbachev proved catastrophic for President Castro's revolution. Moscow in effect pulled the plug on the Cuban economy by refusing to take its sugar any more. Still under American blockade and with its Soviet lifeline cut off, chronic shortages and empty shelves in Cuba were inevitable. Tempers grew shorter as the food queues grew longer. By the mid-1990s, many Cubans had had enough. Thousands took to the sea in a waterborne exodus to Florida. Many drowned. It was a crushing vote of no-confidence in their leader. Even his own daughter Alina Fernandez prefers a life of exile as a dissident in Miami to rule under her "despotic" father. President Castro has used US hostility as a reason to reject democratic reforms to his one-party state. But Cuba under his rule has made impressive domestic strides. Good medical care is freely available for all, there is 98% literacy, and Cuba's infant mortality rates compare favourably with Western nations. Fidel Castro retains his ability to rattle and irritate the US, lately engaging in a diplomatic tussle with the US Interests Section over a propaganda display outside the building. He has also engineered a rapprochement with oil-rich Venezuela, run by his great friend, Hugo Chavez. While many Cubans undoubtedly detest Castro, others genuinely love him. He is the David who stood up to the Goliath of America. Even after nearly 50 years, he remains a divisive figure.